Recently I have been looking in on the BBC Gardening Message Board. Occasionally I make a comment when I have something to add. 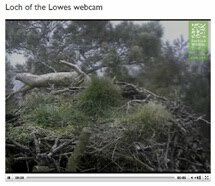 One night I had quite a surprise when I answered one query on hedgehogs. 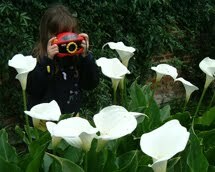 The author replied saying said it was seeing my videos that made her interested in attracting them to her garden. 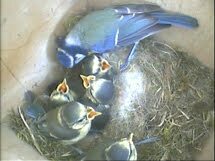 I was well chuffed! However it is a request for ‘complimentary planting’ for ferns that has sparked this post. 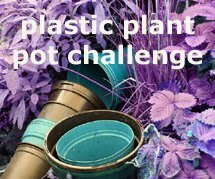 Heucheras, Hostas and Japanese Anemones would definitely be in my list to plant with ferns as a few other comments also suggest. I would also consider mixing different varieties of ferns including evergreen ones. There is quite a range of different leaf formations in ferns from the Cristata’s to the Heart’s Tongue! I could not say which fern has been my favourite over the years but what I will say is that the two most memorable plantings of ferns I have seen so far has to be a huge clump of shuttlecock ferns at Cambridge Botanical Gardens and the Fernery at Tatton Park. 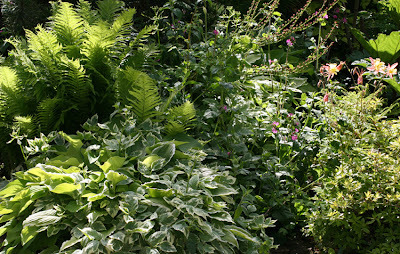 The photos below show some of the planting schemes I am using with ferns in my garden at the moment. I have grown ferns in this garden for sixteen years now and they are definitely another plant group that I could not see my garden without. 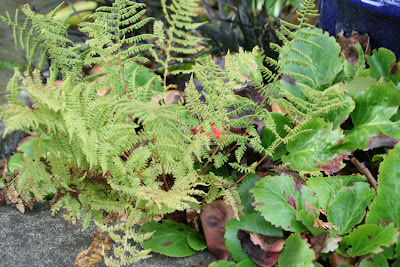 The photo above shows a few varieties of ferns in my garden in May. They are growing in a shady area behind a fence and below a small pine tree with Hostas, Aegpodium, Red Campion, Aquilegia, Dwarf Rhododendron, Gunnera and Thalectrum. Later in the Year the plants on the right of the photo are further in shade when the Gunnera gets taller. 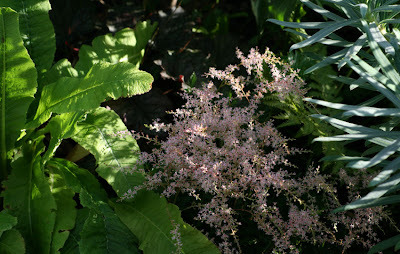 In the photo above ferns are growing at the base of a Pieris with Heucheras, Ornamental Grass and silver leafed Euphorbia. In the photo above the ferns are once again growing with Euphorbia at the edge of my small pond alongside my small domed Acer. Behind it grows Japanese Anemones, Bowles Golden Sedge Grass and Meconopsis. 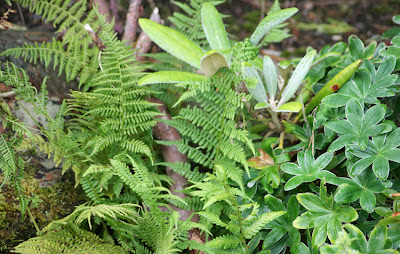 In the photo above ferns are growing in a rockery setting with the smaller leaf of alpine Lady’s Mantle and a selection of ‘Yak’ hybrid Rhododendrons. 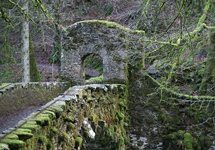 They are growing out of the mossy rocks and through the small densely packed leaves of Polygala. In the photo above ferns are growing through a clump of Bergenia and you can see these ones are starting to get past their best now. You can also see the black grass Ophiopogon in the background too. There is also a pot, which doesn’t contain a fern, I do have other ferns both small varieties and larger ones in pots which look fantastic placed against upright structures like my arbour. 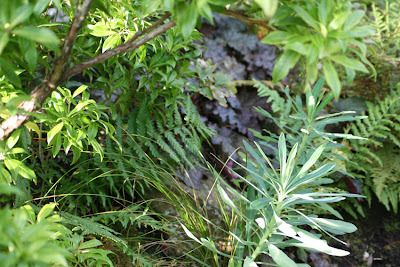 In the photo above ferns are growing once again alongside Euphorbia and Heuchera. They are also under planted with a small Astilbe and Candelabra and Drumstick Primulas. Finally I am finishing this post with the view from behind a fern. Looking at this one from the other side you would see that it backs the trellis of my pergola. Behind it grows my wisteria and in front grows the shrub Choisya ‘Aztec Pearl’. This is a large fern and as it grows up above the choysia it also cover the base of Physocarpus Diablo. The ornamental grass ‘Molina’ adds a delicacy to this area. I hope this post helps raise the profile of this graceful plant – which looks particularly special in the spring as its fronds unfurl. I will add some photos of this later but for the moment it is late and I cannot find them - perhaps it is now time I did a spot of filing with my many photo folders! I will also post photos of the varieties of ferns I have growing in my garden at a later date although now is perhaps not the time to do this as some are past their best now - perhaps this will be a post for next year. 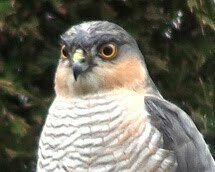 All photos shown above, expect the first one, were taken in my garden on October 6th 2007. Is it telepathy? Some weeks ago I took pictures of my ferns thinking, this could possibly be a post some day. And now I see your big choice of ferns. Beautiful! I like this plant very much, and I bought some new ones this Spring. What an interesting array of plants you have, shirl. 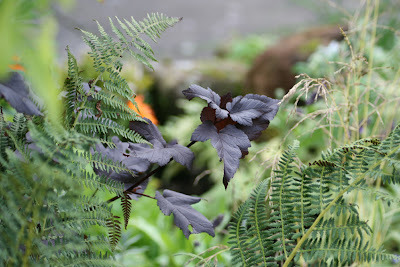 I love the colour, texture and variety of foliage. Your pics are always great too. Interesting story about your hedgehog comment too...see, you're starting a new trend :) Great to get positive feedback! I love ferns! In the botanical garden of Leiden they have lots and lots of them. I used to visit there a lot when I lived close by. Great pics Shirl and how nice that you got some positive feedback on your hedgehog comment! 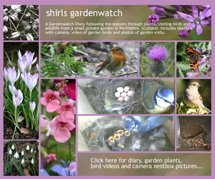 Wildlife Gardener – I certainly have grown many plants over the years – alpines were the very first group I loved. I have always loved foliage plants. Thanks – I am still learning with my camera :-) Yes, I was absolutely thrilled to get feedback especially from a place I did not expect it. Funnily enough this same person found her way back to my blog through this post and was delighted to see I had mentioned her! Lovely pictures! You do combine your ferns well, Shirl... and I'm now really sad that my seeds for alpine lady's mantle didn't germinate this spring. Yours is gorgeous. 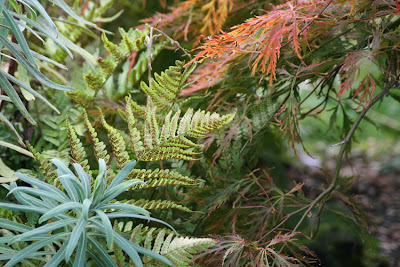 My favorite picture, though, I think, is the fern/euphorbia/maple combination. I love the color there. Thank-you! I am finding it fascinating hearing about the difference in germination between here and USA. I am sorry to hear that you were unsucessful with alpine Lady’s Mantle as in my garden there is a completely different story as it self seeds - although not as prolifically as its larger cousin. I love the way it naturally grows in pockets in rocks etc. I particularly like the silver colour on the underside of its leaves and seeing it with rain on it. Soon it will die back again but for the moment I am still able to enjoy it.